The Nicene-Constantinopolitan Creed (also called the Nicene Creed, the Symbol of Faith, the Pistevo, or simply the Creed) is that creed formulated at the First and Second Ecumenical Councils. It was defined by the Holy Fathers of those first two councils (held in Nicea and Constantinople, respectively) to combat various heresies: notably Arianism, Apollinarianism, Macedonianism (also called Pneumatomachianism), and Chiliasm. Some scholars believe that the Creed promulgated by the First Ecumenical Council was based on an earlier baptismal creed used in Palestine (the Apostles' Creed), while others regard its more likely origin as being a creed issued early in A.D. 325 in Antioch, a so-called "Syrian Creed." 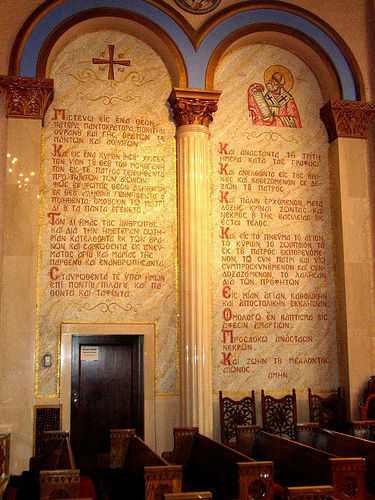 Note: The Nicene-Constantinopolitan Creed as it is recited in Orthodox worship today uses the first person ("I believe..."/"Πιστεύω") rather than the first person plural as it was enacted at the councils. This page was last edited on February 11, 2019, at 15:06. This page has been accessed 192,833 times.